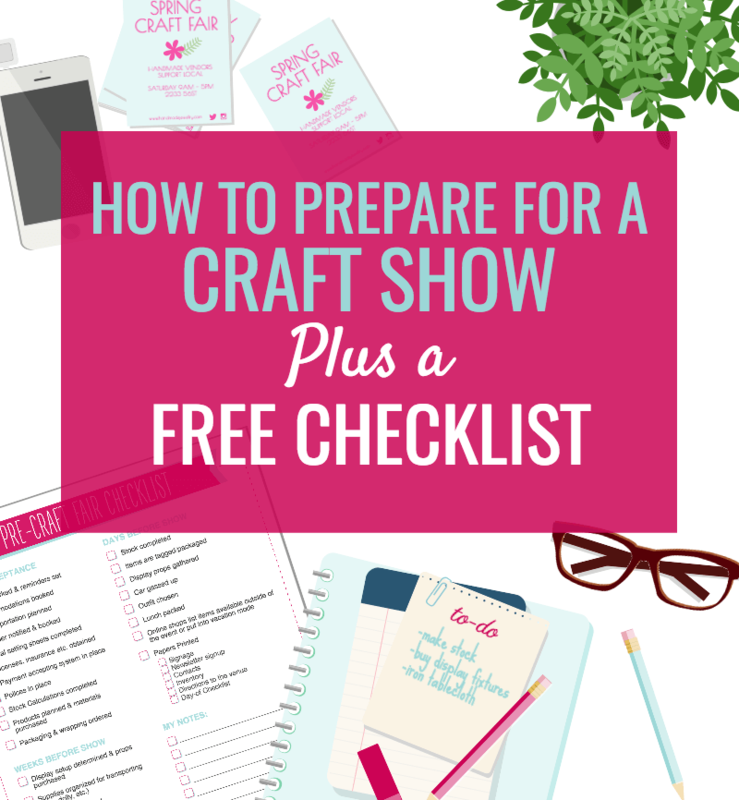 This article is to help you get ready and prepare for a craft show you’ve been accepted to. 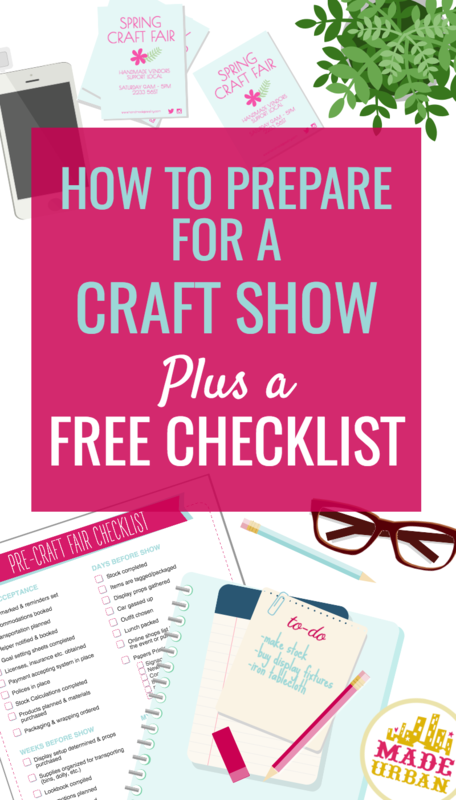 It includes a craft show preperation checklist to download and print off. If you haven’t been accepted to a craft show yet and are looking for ones to apply to or want to increase your chances of being accepted, check out these articles. And if you’ve been accepted and are stressing about getting prepared for a craft show, keep reading…..
Congrats! You’ve been accepted as a vendor at a craft show. That’s a bigger deal than you may realize. Craft shows, markets, festivals and other events are getting more and more competitive so the fact that you were chosen is amazing. Now it’s time to get busy! Take it from someone who was always up late the night before an event; the sooner you start preparing and getting organized, the better. All the little things add up and even if I had completed my sewing the day before, I usually didn’t get to bed until after midnight because I was packing display fixtures and props, tagging items, printing off signage, etc. Let’s make all those late nights of mine have some meaning shall we? I’m hoping you can learn from my mistakes and make use of my craft show preperation suggestions. The tasks listed in this email and the free craft show preparation checklist to download at the end of this article, are pulled from my ebook MAKE MORE MONEY AT CRAFT FAIRS. For further explanation on any of the points, you can download the full ebook here. You can also download the free sample chapter for the book, which will come in handy for some checkpoints. Obviously you don’t want to forget which weekend the event is or double-book yourself at two craft fairs. So enter the date(s) of the event into your calendar. Next, ensure you stay on track. If possible, complete stock production a few days to a week before the event so you have time to complete all the tasks that fall under “Days before the event”, found near the end of this post and on the craft show preparation checklist. Have a look over those tasks now, determine how many days you’ll require to complete them and mark that date on the calendar. For example, if you need 5 days, count 5 days before the event and mark that day as “stock complete”. Then, set reminders between the current date and the stock completion date for tasks that must be completed under “UPON BEING ACCEPTED” and “WEEKS BEFORE THE EVENT”. A complete set of formulas and calculations can be found in the full ebook MAKE MORE MONEY AT CRAFT FAIRS. They’ll walk you through exactly how to determine stock levels for each craft show, based on your goals, the event, your average sales per hour and many more variables. If the event is out of town, book your accommodations and plan your transportation. If you need a helper, notify them and if they’re available, ask them to book the time off. It’s so important to set goals as you prepare for each craft show to treat it like a business. Once you set your goal, start putting elements in place that will help you reach it and factor it into how much stock must be made. Chapter 2 of MAKE MORE MONEY AT CRAFT FAIRS is dedicated to goal setting and making sure you set realistic goals for craft fairs that will stick. Check your local laws as well as find out what’s covered by the organizer. For example, some events will have their own insurance, which you’ll be covered under while others require you to have your own insurance. How are you going to collect money? Cash keeps things simple but keep in mind, a lot of people don’t carry cash these days and not every venue has an ATM. It could cost you a few sales if you don’t accept credit cards. Think about any policies you should have in place to protect your handmade business and profits. Are you going to accept returns if someone gets halfway through the venue and decides they want a refund so they can buy from someone else? Will you accept custom orders or will that take up too much of your time? What if a vendor asks to do a trade? These are much easier to answer (and answer confidently) when you’ve thought about them and defined your rules. You’ll of course need to purchase enough materials to make the amount of handmade products you’ve calculated. If you order supplies online, be sure you get on that right away so production isn’t put on hold because of shipping delays. How your packaging can increase sales is covered in the FREE chapter of my ebook. You can download it for free here. It also includes a bunch of examples when it comes to packaging your handmade products and wrapping them for a sale. You want your brand to be carried throughout the shopping experience, right down to the shopping bag you hand them. Aside from preparing stock in the weeks leading up to the craft show, also consider the following. Do you need to purchase or prepare any display fixtures or props? Tablecloth, risers, decorative elements, etc. If anything needs to be painted or stained (such as wooden risers) be sure you leave enough time to dry before packing day. You’ll want to, at the very least, sketch your display setup and ideally, set up your full display at home to get a feel for it. If you’ve done several events, you may get away with skipping this step. But if you’re altering your craft show display at all or this is your first event, a mock setup will help you see how each element looks and functions. You’ll also get a feel for how much stock you’ll actually be able to display (don’t overdo it, you don’t want your space to look cramped). You don’t want to use any awkward fixtures that make it hard to shop. Be sure you’re applying 1 – 3 techniques mentioned in this article (they’re ones used by multi-million dollar retailers to draw shoppers into their store). Determine how you’ll transport your handmade products and display elements. Purchase any bins or containers or see if there are items at home to use. Laundry baskets and suitcases can be helpful. Do you need a lookbook? If there’s not enough room to display all your handmade products or you offer custom work, consider whether you need a lookbook shoppers can flip through at the end of your craft show table. To make retail connections at the event, have lookbooks printed with all the details store owners need to place an order. Check out this article for info on putting together a professional lookbook and to see an example of one. Make the most of your existing customers and fans. They’ve already proven they love your handmade products so be sure to let them know about your event and give them a reason to visit you (covered in the next point). Give people who are familiar with your brand, a reason to come visit you. Make sure you’re still profiting but consider running a special promotion for the first ______ shoppers to stop by, a discount for Facebook fans that mention a particular post or send out coupons to existing customers. You may want to organize a giveaway or draw for people who stop in your booth or sign up for your newsletter. Or you could give out samples of your handmade product to draw more shoppers in. Think about what type of promotion to run (if any) and determine what needs to be done to execute it. Don’t just wing it, think about what shoppers should know about your handmade products, what you do differently from other vendors selling similar products and the features shoppers truly care about. This is essential when you’re having conversations with shoppers and to determine what should be mentioned in your signage. Need a little help in the sales department? Don’t we all? 😉 It was my least favorite part of craft shows but I did find ways to make it more natural and share info shoppers actually cared about. Not putting effort into making sales is leaving a lot of money on the craft show table. Download MAKE MORE MONEY AT CRAFT FAIRS for tons of tips to step up your selling game and worksheets to guide you through what to say to shoppers. If you’re contributing to swag bags, make sure you strategically plan what to contribute. Throwing your business card in likely won’t have an affect on sales. Think about what you would love to receive and what would make you head over to a table. 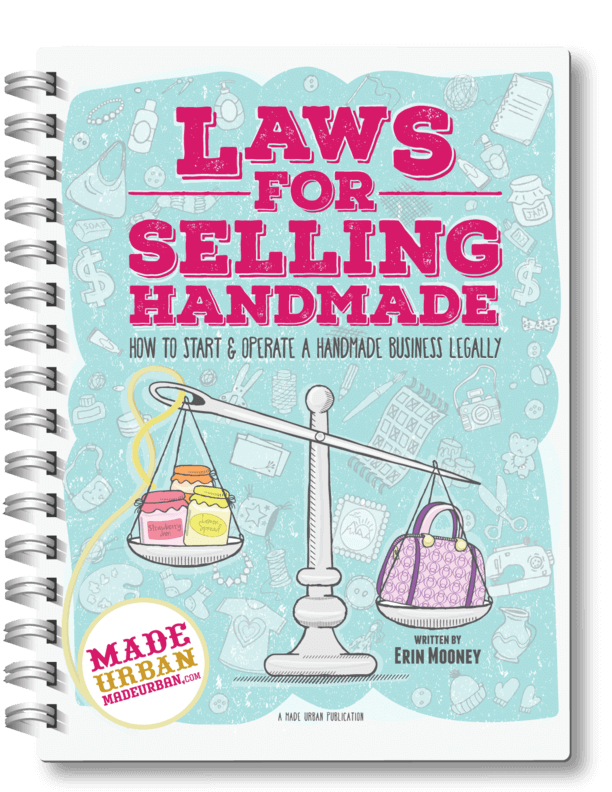 Download the free sample chapter from MAKE MORE MONEY AT CRAFT FAIRS and check out the GETTING A RETURN ON SWAG BAGS section for lots of ideas on what to contribute to see an increase in sales. Consider what you need to do when it comes to managing stock you sell online. You don’t want that one-of-a-kind handmade item to be listed on your website and for sale at the event. What happens if that one item sells to two people? To keep sales rolling in through your website while you’re at the craft show, determine if that affects how much stock you need to make and be sure to place any items aside that will remain listed on your website. If the craft show affects your online sales; such as replies, shipping times, etc. plan for how you’ll communicate that to your online shoppers. A message at checkout or placing your shop in vacation mode will take away the stress of having to check website sales during the event. If you supply your handmade products to retailers on a consignment agreement, notify them if there will be any changes to your ability to fill orders. It’s not a good idea to pull inventory from consignment stores to take it to your craft show. You’ve agreed to supply them with the stock so it would be unfair to take it away last minute. What you could do is check in with them and see if there’s any stock they’d like you to pick up (if it’s been in there for several weeks). Otherwise, simply let them know if you’re unable to restock them for a few weeks due to craft show preperation. Finish details for your product; tagging, packaging, documenting inventory, etc. Prepare wrapping supplies; printing stickers, stamping shopping bags, pre-cutting ribbon, etc. Gather and prepare props; washing and ironing tablecloth, packing risers and stands into crates, etc. Plus 6 printables to keep you organized for tasks like collecting emails at an event, tracking inventory, tracking craft shows you’ve applied to, want to apply to, have been accepted to, etc. And if you don’t want the full ebook but would love the set of checklists and printables, you can purchase them for $5 (CAD) here. Download the Preparation Craft Show Checklist for FREE by signing up for our newsletter below. If you need further direction or details on any of the areas mentioned in this article, please download the full ebook MAKE MORE MONEY AT CRAFT FAIRS.